1. In a bowl mix the dry ingredients all purpose flour, wheat flour, baking soda, pinch of salt and sugar.Stir in milk and bananas just until moistened. 2. Pour or scoop the batter onto the griddle, using approximately 1/4 cup for each pancake. 3. Turn and cook till the bottom part turns to nice brown in color. These Banana Pancakes can be served warm for breakfast . 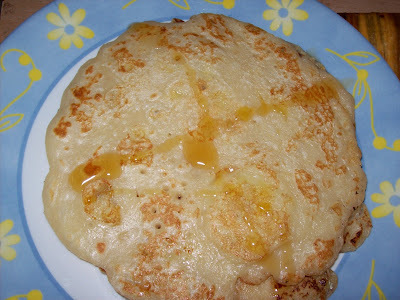 I served pancake with honey.. Its a big hit with my kids. Wow your recipes look so mouthwatering! @ sameera... yea thanks dear..! this is new recipe to me...looks delicious and geat.. Thank you suma. really this pancake is v. delicious. Thankyou usha.welcome to my blog. Hi, can the all purpose flour be skipped n only wheat flour be used?